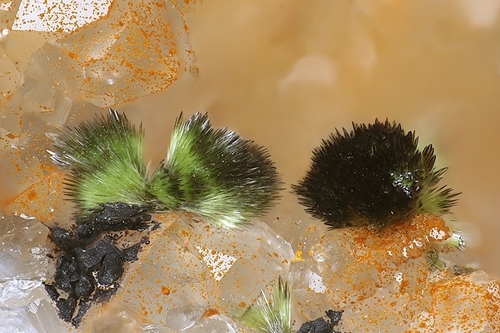 Duftite: Mineral information, data and localities. Olive-green, grey-green; light apple-green in transmitted light. Named by Otto Pufahl in 1920 for Gustav Bernhard Duft [b. 1859 Clausthal, Germany - 1924? ], second General Manager of the Tsumcor Mine (Tsumeb Mine), Namibia (~1906), but Duft was active in Namibia as early as 1892. Guillemin (1956) distinguished two kinds of duftite: "duftite-α" = duftite (space group Pnam) and (Ca-bearing) "duftite-β" = duftite (space group P212121). Adelite-Descloizite Group. Conichalcite-Duftite Series. Duftite-Mottramite Series. Duftite-alpha is possibly a variety of Duftite isostructural with Descloizite (for literature see Duftite). Modern studies needed. 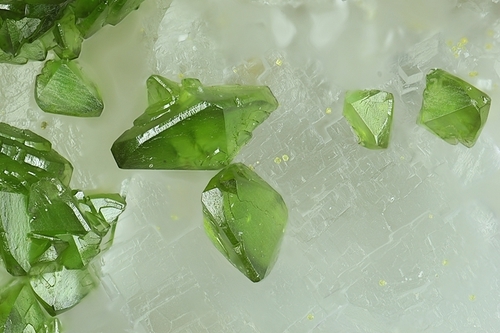 Duftite-β was found to be a compositional intermediate in the duftite–conichalcite series, which has a modulated structure based on the intergrowth of the two structures in domains of approximately 50 Å: Kharisun et al, 1998. Originally described from Tsumeb Mine (Tsumcorp Mine), Tsumeb, Otjikoto (Oshikoto) Region, Namibia. Lustre vitreous on fracture surfaces; dull on crystal faces. Usually unobservable in botryoidal aggregates. Usually botryoidal, rare tiny crystals elongated  with curved and rough faces aggregated into crusts. Pseudo-octahedral. Oxidized zone of a polymetallic deposit. 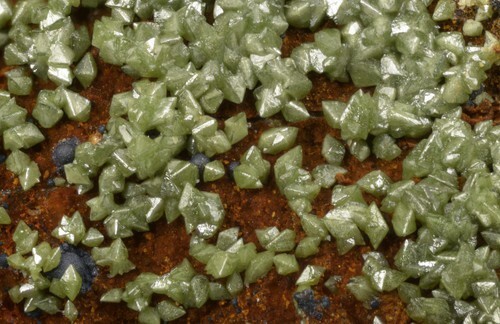 Calcio-duftite Ca-bearing variety of duftite (solid solution between duftite and conichalcite). Duftite-β Duftite-beta was found to be a compositional intermediate in the duftite–conichalcite series, which has a modulated structure based on the intergrowth of the two structures in domains of approximately 50 Å: Kharisun, 1998. Calcite 369 photos of Duftite associated with Calcite on mindat.org. Dioptase 99 photos of Duftite associated with Dioptase on mindat.org. Mimetite 84 photos of Duftite associated with Mimetite on mindat.org. Cerussite 78 photos of Duftite associated with Cerussite on mindat.org. Malachite 51 photos of Duftite associated with Malachite on mindat.org. Wulfenite 44 photos of Duftite associated with Wulfenite on mindat.org. Dolomite 30 photos of Duftite associated with Dolomite on mindat.org. Azurite 28 photos of Duftite associated with Azurite on mindat.org. Quartz 20 photos of Duftite associated with Quartz on mindat.org. Rosasite 17 photos of Duftite associated with Rosasite on mindat.org. Pufahl (1920) Centralblatt für Mineralogie, Geologie und Paleontologie, Stuttgart: 289. Barth and Berman (1930) Chemie der Erde, Jena: 5: 30. Strunz, H. (1939): Mineralien der Descloizitgruppe. Konichalcit, Staszizit, Austinit, Duftit, Aräoxen, Volborthit, Pyrobelonit. Zeitschrift für Kristallographie, Mineralogie und Petrographie, Leipzig (A) 101, 496-506. Richmond (1940) American Mineralogist: 25: 458. Claringbull, G.F. (1951) New occurrences of duftite. Mineralogical Magazine, 29, 609–614. Guillemin, C. (1956) Contribution a la minéralogie des arséniates, phosphates et vanadates de cuivre. I. Arséniates de cuivre. Bulletin de la Société française de Minéralogie, 79, 7–95, esp. 70–80 (in French). American Mineralogist (1957): 42: 123. Jambor, J.L., D.R. Owens, and J.E. Dutrizac (1980) Solid solution in the adelite group of arsenates. Canadian Mineralogist, 18, 191–195. Kharisun, M.R. Taylor, D.J.M. Bevan, and A. Pring (1998) The crystal chemistry of duftite, PbCuAsO4(OH) and the beta-duftite problem. Mineralogical Magazine, 62, 121–130. Callegari, A.M., Boiocchi, M., Zema, M. Tarantino, S.C. (2017): Crystal structure refinement of duftite, PbCu(AsO4)(OH), from Grube Clara, Oberwolfach, Schwarzwald, Germany. Neues Jahrbuch für Mineralogie - Abhandlungen: Journal of Mineralogy and Geochemistry 194, 157-164. The following Duftite specimens are currently listed for sale on minfind.com. [Mandarino, 1997]. Nickel, E.H., Gartrell, B.J. (1993) Secondary Minerals of Ashburton Downs Western Australia, Mineralogical Record (May-June 1993) 24:3: 203-218. Kolitsch, U., Bernhard, F., Brandstätter, F. & Auer, Ch. (2011): 1703) Adamin, Duftit und Rosasit aus dem Bergbaurevier Annaberg, Türnitzer Alpen, Niederösterreich. Pp. 168-169 in Niedermayr, G. et al. (2011): Neue Mineralfunde aus Österreich LX. Carinthia II, 201./121., 135-186. C.Auer (2013); Kolitsch, U., Auer, C. & Zeug, M. (2017): 2046) Austinit, Billingsleyit, Konichalcit, Lenait?, Luzonit, Marrit, Trechmannit und Zinkrosasit von Annaberg, Niederösterreich (ein Vorbericht). Pp. 265-268 in Walter, F. et al. (2017): Neue Mineralfunde aus Österreich LXVI. Carinthia II, 207./127., 217-284. Walenta, K. (1992): Die Mineralien des Schwarzwaldes. Chr. Weise Verlag, München, 336 pp. (in German); Callegari, A.M., Boiocchi, M., Zema, M. Tarantino, S.C. (2017): Crystal structure refinement of duftite, PbCu(AsO4)(OH), from Grube Clara, Oberwolfach, Schwarzwald, Germany. Neues Jahrbuch für Mineralogie - Abhandlungen: Journal of Mineralogy and Geochemistry 194, 157-164. J. Gröbner und U. Kolitsch (2005): Neufunde aus dem Bergrevier Schneeberg im Erzgebirge. Lapis 30 (7-8), 71-73; 81-82. EDX analysis by Italo Campostrini; Bortolozzi, G.M., Bracco, R., De Tuoni, F., Vidus, L., Bittarello, E., Marengo, A., Ciriotti, M.E., Zorzi, F. (2018) Antiche miniere e affioramenti metalliferi a Comeglians (Val Degano, Friuli-Venezia Giulia): recenti ritrovamenti. Micro, 16, 1-2018, 2-36. Guastoni, A., Pezzotta, F., Vignola, P. (2006): Characterization and genetic inferences of arsenates, sulfates and vanadates of Fe, Cu, Pb, Zn from Mount Cervandone (Western Alps, Italy). Periodico di Mineralogia, 76, 141-150.; Piccoli, G.C., Maletto, G., Bosio, P., Lombardo, B. (2007). Minerali del Piemonte e della Valle d'Aosta. Associazione Amici del Museo "F. Eusebio" Alba, Ed., Alba (Cuneo) 607 pp. ; Guastoni, A. (2009): Monte Cervandone. Recenti novità mineralogiche. Rivista Mineralogica Italiana 2009 (1), 38-48. Guastoni A., Pezzotta F., Vignola P. (2006): Characterization and genetic inferences of arsenates, sulfates and vanadates of Fe, Cu, Pb, Zn from Mount Cervandone (Western Alps, Italy). Per. Mineral., 76, 141-150; Piccoli G.C., Maletto G., Bosio P., Lombardo B. (2007): Minerali del Piemonte e della Valle d'Aosta. Associazione Amici del Museo "F. Eusebio" di Alba, Ed., Alba, 607 pp. ; Guastoni A. (2009): Monte Cervandone. Recenti novità mineralogiche. Riv. Mineral. Ital., 33, 1 (1-2009), 38-48. Palache, C., Berman, H., & Frondel, C. (1951), The System of Mineralogy of James Dwight Dana and Edward Salisbury Dana, Yale University 1837-1892, Volume II: 811; Canadian Mineralogist (1980): 18: 191. Števko M., Sejkora J., 2016: Nové nálezy sekundárnych minerálov na lokalite Ľubietová-Podlipa a Poniky-Drienok. Minerál, 24, 6, 524-532 (in Slovak). Schmutz, L., Graeser, S., Eichin, R., Stoecklin, D., Rüegg, H.R., and Düggelin, M. (1982): Mineralienfreund 20, 1-24; 29-56. Stalder, H. A., Wagner, A., Graeser, S. and Stuker, P. (1998): Mineralienlexikon der Schweiz. Wepf (Basel), p. 143. [var: Calcio-duftite] Claringbull, G.F. (1951) New occurrences of duftite. Mineralogical Magazine, 29, 609-614.; Kingsbury, A.W.G. and Hartley, J. (MS) (1951) New occurrences of rare minerals in the northern part of the English Lake District: part 1.; Cooper, M.P. and Stanley, C.J. (1990) Minerals of the English Lake District: Caldbeck Fells. Natural History Museum Publications, London, 160 pp. Turner, R.W. and Rumsey, M.S. (2010): Mineral Relationships in the Mendip Hills. Journal of the Russell Society, vol 13, pp 3-46.
ⓘ Unnamed Occurrence (ARDF - BN135; in headwaters of upper Niukluk River) ? Anthony, J.W., et al (1995), Mineralogy of Arizona, 3rd.ed. : 208. Anthony, J.W., et al (1995), Mineralogy of Arizona, 3rd.ed. : 208; Williams, S.A. (1968), Wickenburgite, a new mineral from Arizona, Am.Min. : 53: 1433-1438. Anthony, J.W., et al (1995), Mineralogy of Arizona, 3rd.ed. : 208; Williams, S.A. (1968), Wickenburgite, a new mineral from AZ, Am.Min. : 53: 1433-1438. Anthony, J.W., et al (1995), Mineralogy of Arizona, 3rd. ed. : 208. Galbraith, F.W. (1947), Minerals of Arizona, AZ Bur. Mines Bull. 153: 208. Murdoch, Joseph & Robert W. Webb (1966), Minerals of California, Centennial Volume (1866-1966): California Division Mines & Geology Bulletin 189: 50, 172.; Calif. Div. of Mines & Geology Bull. #189, Murdoch, et al (1966): 50. Pemberton, H. Earl (1983), Minerals of California; Van Nostrand Reinholt Press: 323. Mineral News Vol 16-5 Adams, Paul Microminerals From the Reward Mine, Inyo Co., California; Adams, Paul (2010) The Brown Monster and Reward Mines Inyo County, California. Mineralogical Record 41:175-193.; Adams, Paul (2010) The Brown Monster and Reward Mines Inyo County, California. Mineralogical Record 41:175-193. Bulletin of the Mineralogical Society of Southern California, Vol. 76 No. April 2006; Robert M. Housley (2005) Recent rare mineral finds in southern California and Nevada desert mines. Abstracts from the 2005 Desert Symposium. California State University, Desert Studies Consortium and LSA Associates, Inc.
Murdoch, Joseph & Robert W. Webb (1966), Minerals of California, Centennial Volume (1866-1966): California Division Mines & Geology Bulletin 189: 172; Pemberton, H. Earl (1983), Minerals of California; Van Nostrand Reinholt Press: 323; Mineralien Welt 1/93: 44. The Minerals of Rhyolite Pass, Mineral Co.,NV. A Preliminary Report. Storm S. Sears NCMA website. Jenkins, R.A. II: The Picking Table:34(2):6-11 (1993); Dunn(1995):Pt5:667.